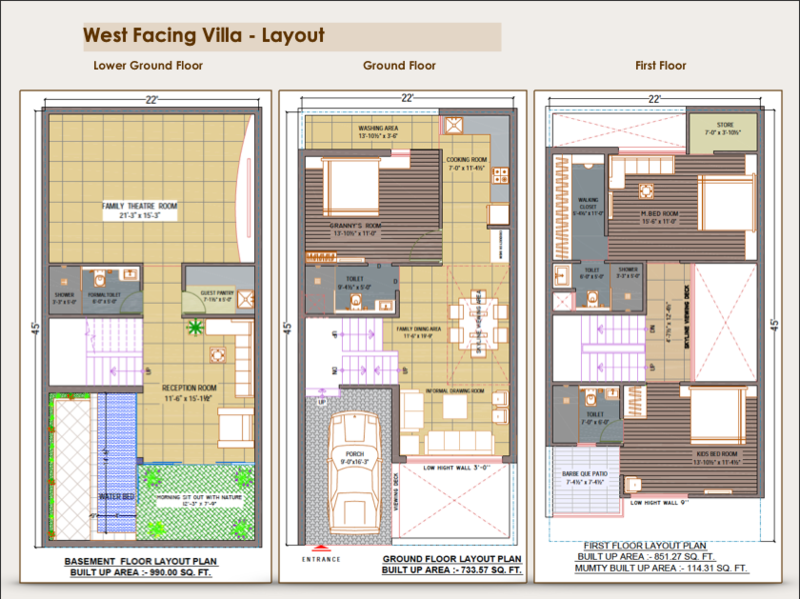 “Icarus Dev Vihan” is one of its kind villa project having only 30 luxurious villas. Project has more than 25,200 Sq. Ft. area to be kept for park for the residents provide ample opportunity to kids to play and elders to breath and admire the nature. The “Sai Baba Temple” situated in the park is an excellent offering to live in the lap of “Shri Sai Baba”. “Icarus Dev Vihan” is fully covered single gated villa project ensure tension free complete secure environment to your family. “Icarus Hotel” at the front of the project provide opportunity to have life time membership to avail all the facilities such as club, swimming pool, gymnasium, lounge, banquet hall. “Icarus Commercial Arcade” shall provide all necessary household shopping experience to its residents for daily requirements. And will have events on all the weekends to enjoy with family. 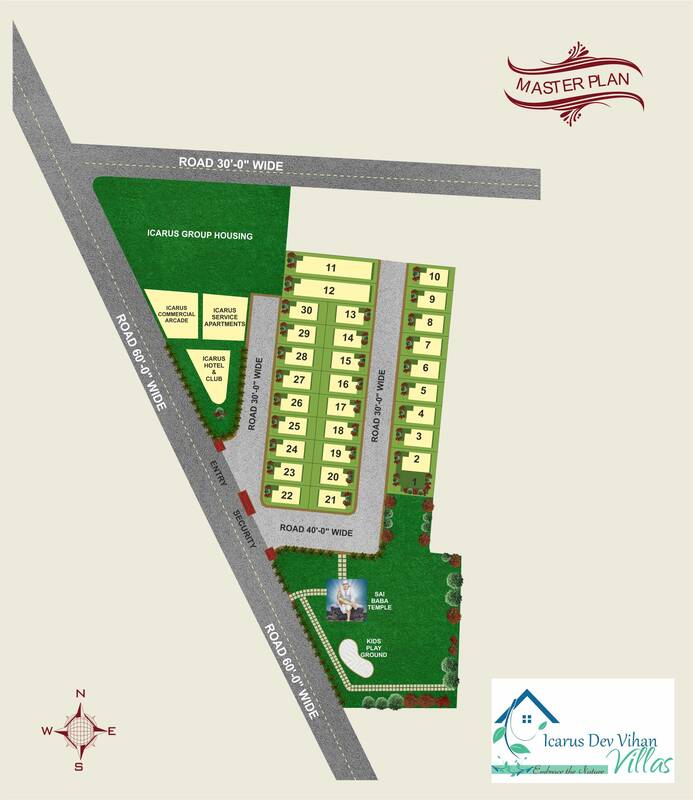 “Icarus Dev Vihan” has all East and West Facing Villas designed keeping Vastu in mind to Healthy & Wealthy life to its residents. “Icarus Dev Vihan” has the wide entrance of more than 150 Ft. gives grand luxury entrance. “Icarus Dev Vihan” has the open area of more than 60% approx. Which is the highest in the villa project in the surroundings. 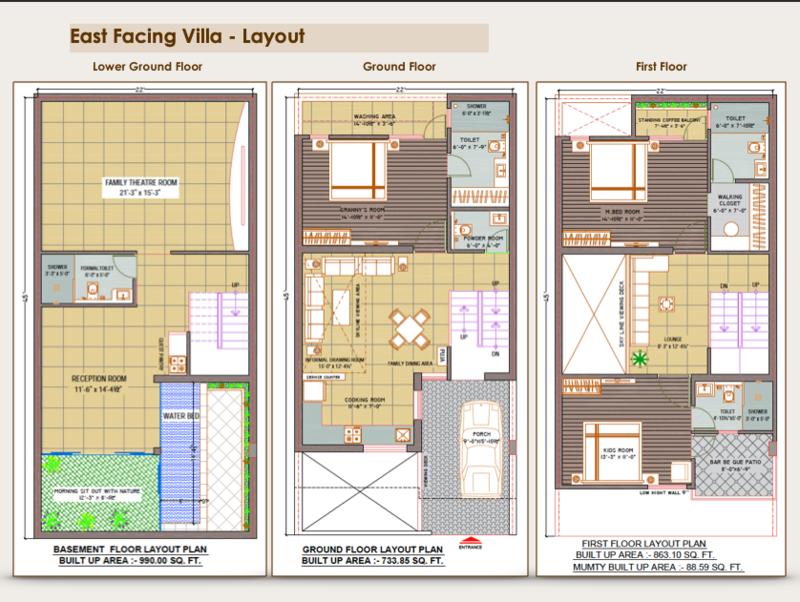 30 beautifully located East And West facing Villas, Each Villas shall have Apporx. 110 Sq. Yds. of Land and More Than 2600 Sq. Ft. Constructed Area, Which will have three spacious bedrooms with Luxurious attach toilets, Big Size Balcony, Spacious Kitchen, Park With Sit Out, Water Bed (If Opted), Direct View of Skyline - day and night, right from the inside of your villa, Sufficient Storage Area, Wardrobe Space, Fully Ventilated. Spacious Drawing Room and Dinning Room, Space for Home Theater / Party Hall, Open from Both the Sides, Opportunity to construct one more floor on the roof.